Reading The Children’s Book this summer transported me to Edwardian England and the golden era of children’s literature. Even before I’d finished it, I was dying to delve into the titles Byatt mentioned – classics I’d grown up with like Peter Pan and The Railway Children, but also others I’d never heard about (or only in passing) and which I immediately wanted to get my hands on: Kenneth Grahame’s The Golden Age, George MacDonald’s At the Back of the North Wind, or Kipling’s Puck of Pook’s Hill. I looked through the children’s books in the attic (you can usually trust my mother to have bought a rare edition of something or other ten years before you even knew it existed) and I came across a beautiful hardcover copy of E. Nesbit’s The Enchanted Castle which used to belong to me. “Oh look!” I cried in delight, though there was nobody there but me. For if there is one book I remember from my childhood, it is this one – never mind Black Beauty, Heidi, and Treasure Island, this was the Book of Books, the one book that ruled them all! 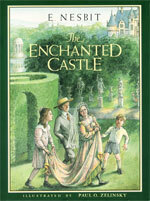 The Enchanted Castle recounts the adventures of Gerald, Cathy, Jimmy, and their friend Mabel. Cathy and her brothers can’t go home for the holidays because their cousin has the measles, so they are obliged to spend the summer at Cathy’s school, in the care of the French teacher, “Mademoiselle” – a circumstance they are gloomily certain will preclude all fun and adventures. But one day, while out on a walk, they stumble upon the entrance to a secret tunnel, and suddenly, they are in the midst of the adventure of a lifetime! For when they emerge once more into the sunlight, they are in the gardens of a beautiful castle, complete with maze and lake. There they make the acquaintance of the housekeeper’s niece, Mabel, who takes them into the castle’s treasure chamber, where sliding panels reveal glittering jewels. Among the gold and precious stones is a plain metal ring which Mabel tells them has magical properties. The children don’t believe her, until it makes her invisible – and then won’t make her visible again. Suddenly, things are very complicated. Helping Mabel without alarming her aunt or lying to Mademoiselle proves a tricky business, especially as the ring’s magic is unpredictable and keeps getting them into one scrape after another. Over the course of the next few days, Gerald gets embroiled in a robbery, Cathy is turned into a statue, Jimmy is transformed into an old gentleman who does business in London, and the girls unwittingly bring to life a group of Ugly-Wuglies who prove more difficult to deal with than all the rest put together. Luckily, some of their adventures are more enjoyable: my favourite part of the book – the one I eagerly wait for and read with a thrill of delight every single time – is when the statues in the garden come alive in the moonlight and the children are invited to join the banquet of the Greek gods on the island in the middle of the lake. The garlands of fresh roses woven nightly to crown the gods and goddesses, the laughing boyish statue of Phoebus Apollo who swims in the lake with the stone dinosaur, and the cool whiteness of the gods’ limbs in the moonlight (the magic brings them to life not as flesh, but as living marble) still keep me spellbound, just as they did when I read about them for the very first time, almost twenty years ago. Many wonderful stories have been written for children, but none blends adventure and magic, humour, poetry and romance, in such an imaginative way as The Enchanted Castle. It struck a chord with me as a child and has never ceased to enchant me since. This entry was posted in Book Reviews, Children's Literature and tagged adventure, castle, children, garden, Greek gods, holiday, magic, magic ring, statues. Bookmark the permalink.